Bolger, Dermot. Ed. 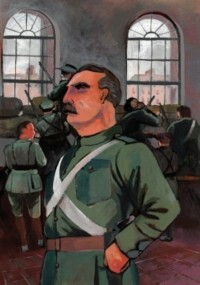 16 on 16: Irish Writers on the Easter Rising. Dublin: Raven Arts P, 1988. Print. This bibliography is a work in progress and the site will be updated as new information becomes available. The novels are organized with two lists: the "Complete Bibliography" is MLA formatted with full bibliographic information and links to each novel's annotation; the "List by Title" is an abbreviated version, alphabetized by title, but including links to annotations. The annotations themselves provide three types of information about the novels: a plot summary, a list of key characters, and a publication history. Please feel free to contact Danine Farquharson with any suggestions, corrections, or comments.